This kitchen had been remodeled by a previous owner who had installed a lower ceiling to hide new plumbing installed for the bathroom above; as well as the oak cabinets and appliances. This ceiling height made the space Closter phobic for the current husband who is tall. The oak cabinets made the room dark in spite of the 2 large windows. The home owners and I discussed the options for the space. The basic configuration was fine at the cooking end of the room, but storage was lacking and the 48” wide hood was oversized for the cooktop. The other end of the room had an oak table and chairs for casual dining in front of a nice window. The opposite wall had a desk with cabinet storage above used for fine china and serving pieces. The existing wood flooring was to remain. 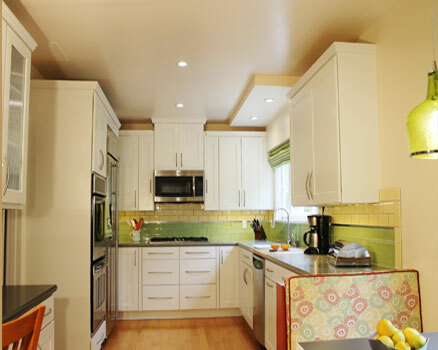 We concluded that the cabinets should be white to brighten up the space and that the ceiling should be raised as much as possible. We agreed on which base cabinets and wall cabinets should be replaced and that the remaining could be painted. We agreed that all the cabinets should receive new Shaker style white doors and drawer fronts. Much needed storage was achieved with corner lazy Susan’s and deep drawers in the base cabinets. Two new upper cabinets were added on either side of the new microwave/hood with pullouts for spices. The new and existing wall cabinets received a 3 step, Art Deco style crown. All the cabinet pulls are brushed nickel with a curve shape as a nod to the original Art Deco style of the house. The existing stainless dishwasher, wall ovens and side-by-side refrigerator remained. A new undermount sink and faucet was installed. To bring in color we looked at the back splash and countertops. The couple’s favorite colors are green and yellow. A bright green glass subway tile was selected for the backsplash. After looking at several designs for the tile layout at the stove and in general, the final design adds a 1” chrome strip above the 3 rows of green glass tile, topped by a creamy butter subway tile. This design compliments the medium gray quartz countertop in the cooking area. A wood butcher block was installed to the right of the sink. Darker gray quartz is used on the new desk area, defining it as a separate space. The walls and ceiling are painted a light melon. When we removed the existing ceiling, we discovered that the original ceiling, 8” higher was still there for the most part. The area directly below the 2nd floor bathroom had been removed and some of the pipes were below the original ceiling. The plumber was able to replace some of the pipes to get them up above the ceiling line except directly above the sink area. A new ceiling was framed to create a drop over the sink space with recessed LED lights. We address the lighting issues for the total kitchen by adding 2 recessed LED lights in the center of the ceiling. The wall cabinets received LED under cabinet strip lights. The new microwave/hood also has task lights. The breakfast area received a versatile make over with custom bench seats with upholstered seats and backs that add color and playfulness to the room. The bench seat flips up to access a large storage space. A new green seed glass pendant adds light and charm over the table. The laundry room received a full remodel from new linoleum flooring, new ceiling lights and a pocket door. The laundry room was repurposed with the removal of an old utility sink and a new design that incorporated a full size, stack washer and dryer, as well as a 2nd party refrigerator. New upper and lower cabinets and quartz countertops add utility to the room. The countertops are also lined with a backsplash of the green glass tile. The completed remodel resulted in a bright and functional kitchen and laundry room that the family will enjoy for many years to come.